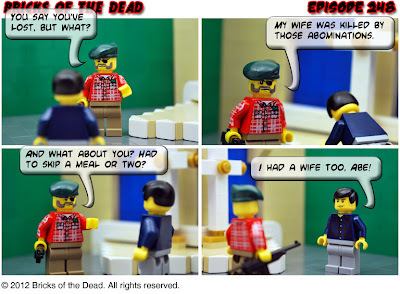 Last week I discovered a cool website that published a webcomic series on LEGO Zombies. Its been around for a while, since 2010 I believe, and the writer Dave does a great job. Its a real fun read and so far he has over 320 strips! He does a lot more than the webcomic too. He also reviews all kind of LEGO sets, Zombie MOCs, and even episodes of The Walking Dead. All sorts of zombie goodness.